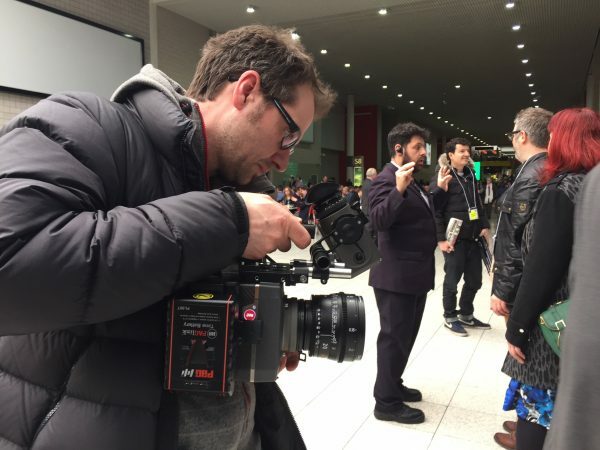 At the BVE show in London this week ARRI were showing the new ALEXA MINI publically for the first time. Newsshooter gained exclusive access to the camera and we were able to shoot with the prototype for a short time. Newsshooter team members Simon Glass, Elliot Smith and myself filmed handheld test shots in and around the EXCEL complex where the exhibition was being held. Q: What was ARRI’s rationale when creating this camera? A: One of our customers’ primary requests was for a compact and lightweight camera that would complement the ALEXA camera system. These requests were mainly driven by workflow or grading issues when having to integrate footage from 3rd party cameras with the material shot on ALEXA, but also by the desire to have an equally easy-to-use and reliable camera as the ALEXA. In addition, operators of handheld gimbals and multicopters suggested to us that the majority of their customers would be interested in using an ALEXA on such rigs, which wasn’t really practical with our main unit cameras. Q: Who do you see as the potential users? A: We expect the camera to be used by everybody who relies on ALEXA as a main camera but struggles with the form factor and weight for certain applications. Crews working on ALEXA-based productions will use the ALEXA Mini in tight environments, on cranes or special rigs, or as a handheld camera. Other users will include individuals working with gimbals and multicopters, or underwater, who want to take their craft to the next level and open up new opportunities on higher-end productions. Q: What is the price-point of the camera? A: Prices for the ALEXA Mini start at EUR 32,500 – body only. ARRIRAW and 4:3 capabilities will be available as license upgrades for EUR 2,950 each, following a software update later in 2015. The complete list of prices will be available through local ARRI partners when we start to accept orders in March. Q: What viewfinder options are available? Can the Mini be controlled without an ARRI EVF? A: There is a long list of options for controlling the camera: first of all the camera supports the MVF-1, which is known from the AMIRA and incorporates a flip-out screen that can be used to control and monitor the camera. For the ALEXA Mini we figured that people would have to plug and unplug the viewfinder cable quite often, so we incorporated a new military-grade connector on the camera, which is rugged and environmentally protected. The button interface on the camera, together with an on-screen display on the SDI output, can be used to change operational parameters like fps, EI, NDs and white balance, so no viewfinder is needed and the camera can be operated just with an on-board monitor. With Transvideo we are working on an integration of the StarliteHD that will allow us to use the StarliteHD’s touch functionality to control the camera; we expect this to work very well as a quick and easy remote option or when the camera is operated on rigs where the button interface is not easily accessible. The camera also supports control via built-in Wi-Fi, through a web application that works on a wide variety of web browsers and a broad range of iOS or Android devices like laptops, tablets and phones. For operators who prefer physical buttons and rotary encoders we will provide a small control unit that attaches to the viewfinder connector and allows quick setup and framing without having to carry a viewfinder or monitor. The panel can also be connected in-between the camera and the viewfinder to allow for a right-side assistant control interface in addition to the viewfinder, not only for the ALEXA Mini but also for the AMIRA. Last but not least, our WCU-4 wireless hand unit can be used to control the camera. The integration not only allows the control of up to three cforce lens motors directly attached to the L-Bus interface on the lightweight titanium lens mount – it also provides reliable remote control of all basic operational parameters of the camera, making the combination of ALEXA Mini, WCU-4 and cforce motors the ideal on-set configuration. Q: What lens mounts are available? A: For the ALEXA Mini we provide a super-lightweight titanium PL mount with an integrated L-Bus interface that allows the daisy-chaining of up to three cforce lens-motors directly from the camera, without any need for an external motor controller. In addition, all AMIRA lens mounts – the EF, B4 and steel PL mounts with Hirose connector – will work on the ALEXA Mini as well. Q: What codecs and resolutions are available? A: At release the camera will be able to record all the typical ARRI ProRes flavors, up to ProRes 4444 XQ in 16:9 HD, 2K Cine, 3.2K and 4K UHD. 4:3 with anamorphic de-squeeze as well as internal ARRIRAW recording to CFast 2.0 cards up to 30 fps and support for external recorders will become available through upgrades during 2015. Q: Will it record 4K? A: The ALEXA Mini will record in-camera ProRes 4444 4K UHD up to 60 fps to CFast 2.0 cards, based on the same ALEV III sensor that is used in ALEXA and AMIRA. Q: Is ARRIRAW support possible in the future? A: ARRIRAW recording is planned as a software license for EUR 2,950 and will be available later in 2015. It will enable internal recording of uncompressed ARRIRAW to CFast 2.0 cards at frame rates up to 30 fps. Not only is ARRI collaborating with CODEX to ensure the ARRIRAW workflow remains streamlined and straightforward, but also CODEX will offer a new external recorder that can record max. 120 fps of uncompressed 2.8K ARRIRAW per camera, up to a combined max. total of 360 fps from up to four ALEXA Minis. 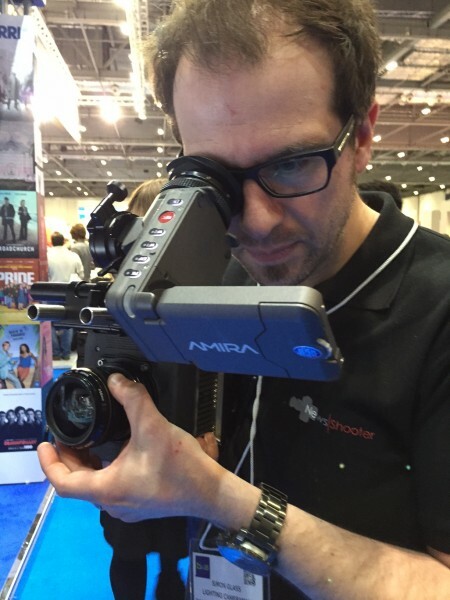 Q: What are the slow motion frame rates on offer? A: The camera will support shooting at 200 fps in HD and 2K Cine up to ProRes 4444. With the external CODEX recorder the camera will be able to record up to 120 fps uncompressed ARRIRAW 2.8K. Q: Which sensor is being used? A: The sensor of the ALEXA Mini is the same ALEV III sensor used in other ALEXA models and in the AMIRA. It offers the same frame rates as the AMIRA sensor but also supports a 4:3 recording mode, like ALEXA. Q: What is the power draw and battery system that needs to be used? A: At regular speeds the power draw of the camera is below 50 W and increases to around 70 W depending on environmental conditions, codec and frame rate. Q: What are the audio features – can XLR and Phantom power be used? A: The camera has a stereo symmetric line-level input. It uses a Lemo connector due to the size and does not supply Phantom power. Q: What is included and what are optional extras? A: The camera can be purchased body-only. Optional extras are the MVF-1 viewfinder, LCD control panel, base plate adapters, cage, cforce lens motors and WCU-4 hand unit. Q: What is the weight of the camera? A: The weight of the camera is around 2.3 kg (5 lbs) including lens mount and built-in motorized ND filters. Q: Does the ALEXA Mini replace the ALEXA M? A: ARRI will continue to offer the ALEXA XT M as it may still be preferable over the Mini to some users due to the higher ARRIRAW frame rates, or in situations (e.g. aerial shoots) when the capacity of the Mini’s internal CFast 2.0 cards is too limiting. Q: How does the ALEXA Mini compare to the ALEXA XT? A: The ALEXA Mini’s design is focused on a compact and lightweight form factor, which is in many respects a compromise compared to our main unit cameras. Our goal for the ALEXA Mini was to provide a very flexible companion camera that will work well alongside our bigger cameras and complement them. The ALEXA XT still has many advantages over the ALEXA Mini and remains the preferred choice for a main unit camera in our view. Q: How does the ALEXA Mini compare to the AMIRA? A: The AMIRA is optimized in ergonomics and functionality for single operators or small crews working on all kinds of documentary-style productions. The ALEXA Mini is ideal for applications where size, weight and flexible rigging are crucial, but other functions like audio recording are less important.